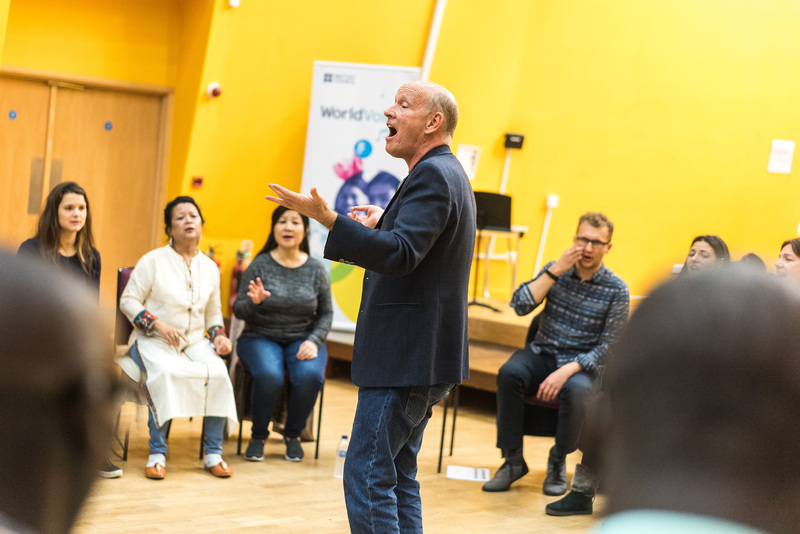 World Voice brings the joy of singing to classrooms across the world. It introduces new skills to teachers, wherever they are, that enable them to improve children's attendance, behaviour, wellbeing and achievement in school. It is a global programme that adapts to the cultural and educational needs in the countries where it operates and can be used to help children learn a foreign language, learn about different cultures, improve their musicality and improve their understanding of maths, georgraphy and other subjects. The programme is designed to support teachers to deliver the curriculum they are already employed to teach. It has also be used effectively to ensure the inclusion of pupils with Special Educational Needs in school life. To date, it has reached in the region of 500,000 children and, with the help of our World Voice Global Ambassador – the world famous, multi award winning singer Joyce DiDonato – our target is to reach at least 1 million. The video below summarises how the programme began and how it works on the ground. There is an increasing body of evidence which supports the idea that music, and singing in particular, is hugely effective at helping children to do better – and improve their wellbeing – at school. A school in Bradford, in the north of England, recently revealed that the secret of their dramatic rise in attainment was down to extra music classes for all pupils and incorporating songs and singing into maths, history and other lessons beyond music. "When you take songs into classrooms ... you find every child, especially those that are bored or not interested in education ... they do not miss that [singing] class. Everybody is in the classroom, active and attentive"
After an initial scoping visit, the local British Council office carries out research to ensure that demand and interest for World Voice is present and strong local partners are willing and able to support World Voice sustainably in the long run. The project can then begin with help from the British Council Music team in the UK. The first visit by a UK vocal leader consists of a set of workshops with a group of children and teachers from participating schools. The teachers learn through observation and also have the opportunity to participate and discuss the tools and techniques they are seeing in action. The workshops culminate with a performance to an audience of invited teachers, head teachers, parents and representatives from regional or national education or cultural ministries, potential partners and other stakeholders. Now that teachers and partners have witness the programme first hand, the programme can really develop in earnest. Over the next year, UK trainers return to the country for a series of intensive teacher training sessions. Teachers in the participating country learn to apply the tools and techniques in their own classroom and some of the teachers will be invited to become Master Trainers. Master Trainers will receive further training and will cascade the World Voice pedagogy to other teachers across the country. An identified group of local Master Trainers cascade the learning to new teachers throughout the country. New resources are developed according to the speicifc country need and the existing World Voice Songbook will be used, shared and updated with new songs from the country. As the programme grows and evaluation demonstrates its value, success stories are shared with ministries or other policy makers. Policy and attitude change at a local, regional or national level is likely to happen in partnership with local agencies and organisations. Richard Frostick studied piano and singing at the Royal Academy of Music and is now acknowledged as one of the UK’s premier singing leaders. He is the founder and director of two music centres that provide high quality tuition for 500 children and young people. In this role he has prepared young choirs for many BBC Proms concerts and for numerous performances on television and radio. He also works across the country as a singing workshop leader and choral conductor. Richard’s books Sound Beginnings and, with songwriter Lin Marsh, Sound Bites, are published by Faber Music. In addition to holding his position as Head of Music at Ysgol Y Creuddyn Secondary School (North Wales) Geth has been successful as a choral conductor, receiving numerous prizes in the National Eisteddfodau and various other music festivals. Christine has toured internationally as a singer and has worked in song, with all ages, in different ways with schools, choirs and community projects. She studied Voice at Central School of Speech and Drama, and was Scots Song tutor at National Centre for Excellence in Traditional Music for almost a decade. She has a varied freelance life, including delivering songmaking and singing projects through her Ceilidhmakers brand, and teaching her arrangements of songs from a variety of traditions, to Community Choirs. Lin has worked extensively in music education with all age groups. She has been an advisory teacher of music in Oxfordshire for over 10 years. As a composer she has written for BBC children’s programmes and was one of the national advocates for the Sing Up programme. Jane brings her passion for singing and creativity through voice and a wealth of experience in Music education. Having implemented change through developing inspirational music programmes as Music Advisor for Newham and ARK Schools, she now runs her own small business, Living Song. Ian has worked extensively in both primary and secondary schools, being Head of Music in two secondary schools. His children's choirs have won many prizes at music festivals. At present he directs, two Area Choirs for NYCoS and for the past two years the Junior Corps of the National Boys Choir of Scotland. "Jane and Ian were really fantastic tutors and we all gained so much from the session in terms of resources, songs and warm up routines." "Practical sessions were fun and interesting – Lin and Geth were excellent. Very useful to be introduced to World Voice."